Holy Moly I can’t believe it’s time for Class of 2020 already!! You guys are AWESOME as you’re already booking sessions! Now is the time to be setting up your session, believe it or not, as summer is often too late to get session times, especially if you are traveling or want a FALL session. SO… here it is… my NEW UPDATED magazine for you guys! We'll discuss ALL of this in person at your consultation (and I'll have a gorgeous printed copy for you to peruse over a coffee) but until then I hope this provides some inspiration for things you want to try in your senior portrait session, including in depth examples of different kinds of locations and photo stories from several kinds of session opportunities we can have in and around Denver. From urban, to natural to mountain and beyond. You'll also find ideas for styling, tips for hair, makeup and wardrobe, a bit more on how the process works. Plus LOTS of pictures to get you excited to tell YOUR story. Or call me at (970) 708.2065 and let me know a good time to reach you! 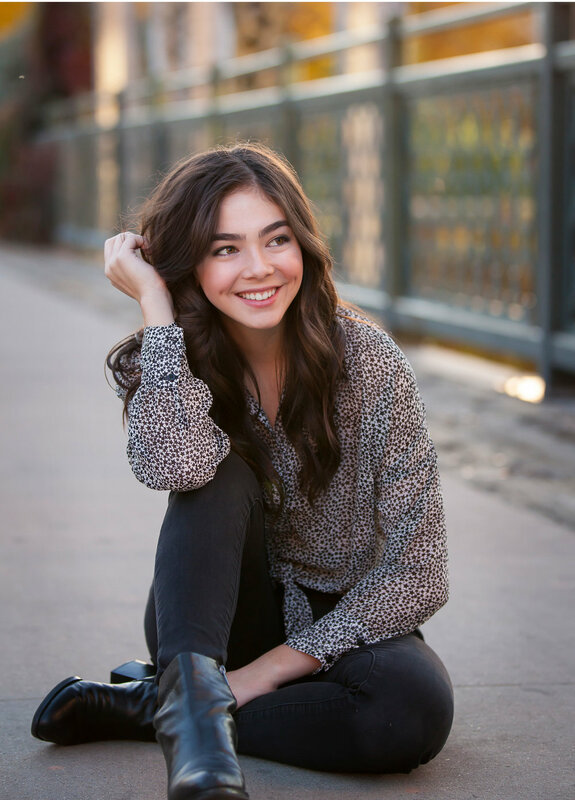 Let's grab a coffee and you can tell me how YOU imagine your senior pictures. LEARN MORE ABOUT SENIOR PORTRAITS WITH JENNIFER! Welcome, Class of 2019 (upcoming) SENIORS!! I just published my NEW senior portrait magazine, designed to visually walk you through the process of the senior picture experience in a bit more depth. We'll discuss ALL of this in person at your consultation (and I'll have a paper copy for you to peruse) but until then I hope this provides some inspiration for things you want to try in your senior portrait session, including in depth examples of different kinds of locations and photo stories from several kinds of sessions we can have in and around Denver, from urban, to natural to mountain and beyond. You'll also find ideas for styling, tips for hair, makeup and wardrobe, a bit more on how the process works. Plus LOTS of pictures to get you excited to tell YOUR story. EMAIL JENNIFER NOW to set up a consultation! Or call me at (970)708.2065 and let me know a good time to reach you! 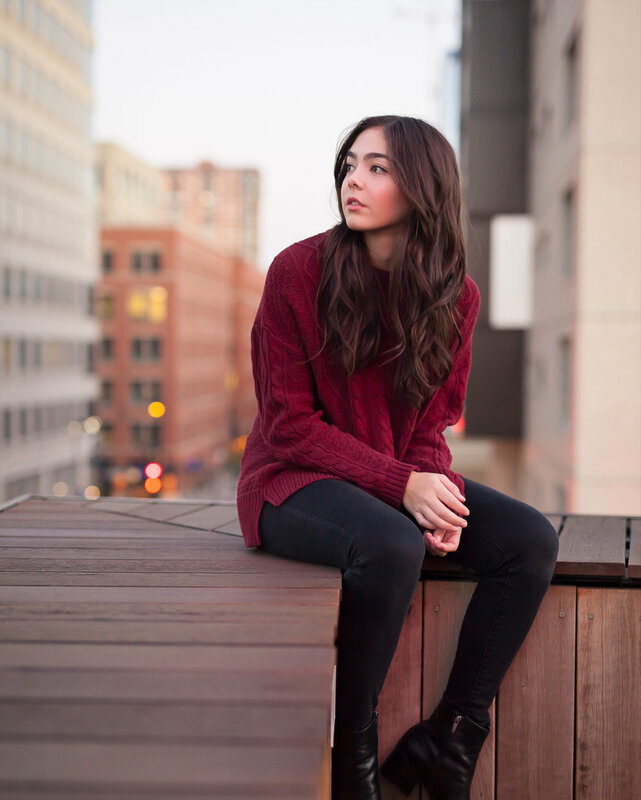 Let's grab a coffee and you can tell me how YOU imagine your senior pictures. I’m not sure I could ever put into words how much I adore photographing this young woman. 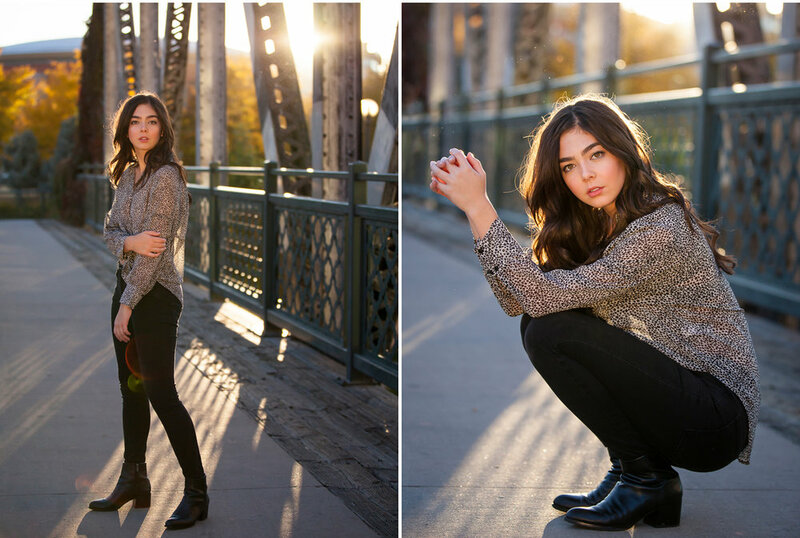 Hopefully these urban, high school senior pictures, which we photographed right in downtown Denver will do the talking for me! She was one of my very first headshot clients some eight years ago, back when I was really comfortable photographing architecture and loved good light, but had little experience with portrait work. I remember being creatively inspired by her unique, ethnically ambiguous look, her adorable dimples and her grounded confidence. In the years since, we’ve watched her beautifully evolve into herself, becoming an extraordinary, intelligent and talented human. This young woman is going places, and I can’t wait to watch the next chapters of her story unfold. As will come as no surprise, the chance to photograph her senior portraits was an absolute honor... and even more joyful than I could have imagined. Having been inspired by luminous frames I've seen in movies recently, I mentioned that I was curious to try rooftop photography, and thought her look might be perfect for this cinematic-inspired shoot. She loved the idea, and so the details of her session location were born. We started out in the alleys and urban corridors surrounding our final destination for the evening, Denver’s Museum of Contemporary Art at dusk. She arrived with a fantastic wardrobe, and the day itself gifted us with a most perfect combination of skies -- cloudy when we wanted clouds, backlit sunshine when that would be most dramatic. And a twilight blue over the city set the perfect backdrop for the exact cinematic portrait session about which I’d been dreaming. OK how about I just share some of the pictures now?? As is hopefully obvious, I absolutely loved every minute of photographing this beautiful human!! Trinity, we LOVE you and can't wait to see what you do next! 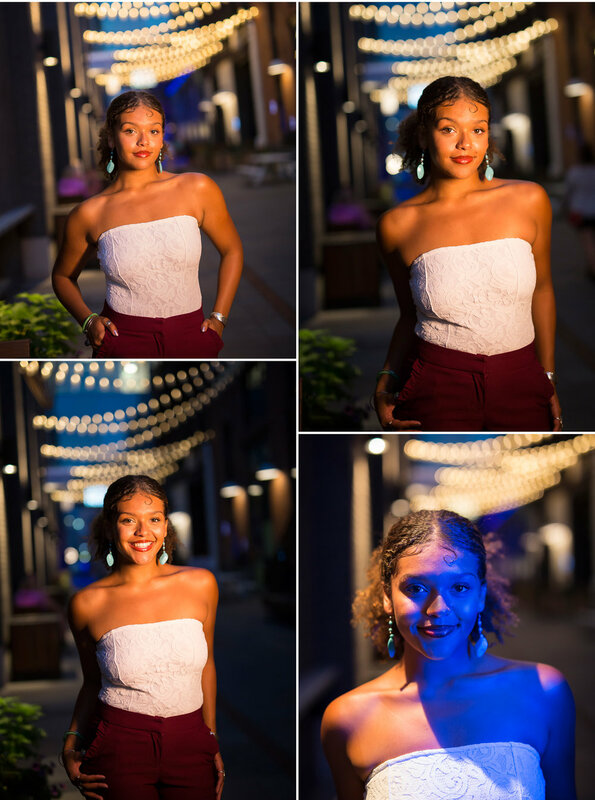 ABOUT THE PHOTOGRAPHER: I’m a fun-loving Denver high school senior portrait photographer specializing in bringing out connection and personality in the eyes of my clients. I strive to do more than just take senior pictures for yearbook. Instead my focus is on creating an unforgettable experience. Together we are telling a part of your story with pictures. I collaborate with each of my clients to design an immersive and empowering portrait experience, custom tailored around his or her personality, style and interests. I’d love to tell a high school senior story about YOU. Let’s grab a coffee and chat about designing an amazing high school senior photo shoot for you! NOW BOOKING Senior Portrait Sessions for CLASS OF 2019! DON’T WAIT -- I had to turn away too many clients last year because we ran out of session times and it broke my heart! Session times for the season book quickly and booking early means you have more date options and flexibility in the event of weather delays. Use the link below to email and set up a portrait consultation now! Click below to send an email to Jennifer. Be sure to include your name, parent's name & email, your school, a PHONE number, and then please check your spam folder if you haven't heard back from me within a day or so! HIGH SCHOOL SENIORS: EMAIL JENNIFER TO SET UP CONSULTATION NOW!